Bar of chocolate, broken into chunks: Dark chocolate in small amounts help to reduce low-density lipoprotein (LDL) cholesterol levels (bad fats), and slows down memory decline. Opt for chocolates that are 70 percent cacao (or cocoa, which is cacao in its roasted, ground form). Milk: Alternatives such as almond and soy milk have lower fat content, but cow’s milk offers a rich source of calcium, a mineral essential for healthy bones and teeth. Sugar: A sugar-laden diet has been linked to weight gain, cavities and an increased risk of heart disease. Cranberry juice: Juice is loaded with fructose (natural sugar). Excessive amounts can lead to obesity and Type 2 Diabetes. Tequila (Alcoholic element) In moderation, alcohol is said to help stimulate metabolism, dissolve fats and aid digestion. Lime wedges for garnish, if desired: Lime is high in vitamin C and antioxidants, which help to boost the immune system. Lime juice and peel can help decrease fatty streaks in coronary arteries, which are indicators of plaque build-up and subsequent cardiovascular disease. Alcoholic beverages are generally high in sugar content and calories — a glass of whisky and Coke contains 250 calories, for example. Excessive alcohol consumption can lead to major health problems, including liver damage and/or diseases. Chronic heavy drinking is linked to a slew of health conditions including increased risk of cancer, cardiovascular disease, brain damage, memory loss, gout and pancreatitis. Always drink in moderation even on special occasions, and never drink and drive. A standard alcoholic drink is defined as a regular can of beer (330ml), half a glass of wine (175 ml) or one nip of spirit (35ml). Practise control: Say “no” if you’re not up for another drink. Get sufficient sleep: HPB recommends six to eight hours of sleep each day. Exercise regularly: Continue working out throughout the holidays. </li><li>Lime wedges for garnish, if desired&#58; Lime is high in vitamin C and antioxidants, which help to boost the immune system. Lime juice and peel can help decrease fatty streaks in coronary arteries, which are indicators of plaque build-up and subsequent cardiovascular disease. </li></ul><h2>One for the Road? </h2><p>Alcoholic beverages are generally high in sugar content and calories — a glass of whisky and Coke contains 250 calories, for example. Excessive alcohol consumption can lead to major health problems, including liver damage and/or diseases. 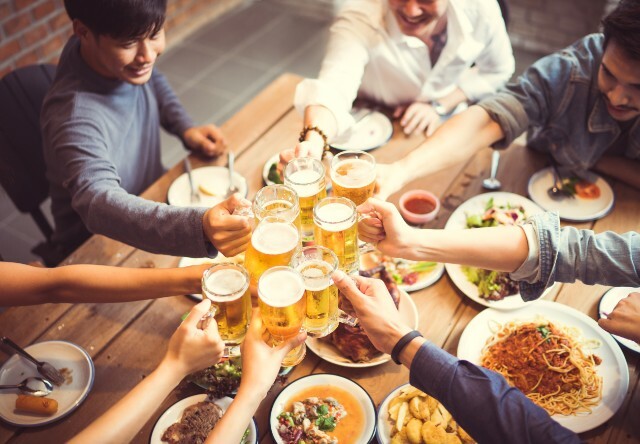 Chronic heavy drinking is linked to a slew of health conditions including increased risk of cancer, cardiovascular disease, brain damage, memory loss, gout and pancreatitis. Always drink in moderation even on special occasions, and never drink and drive. </p><h2>How Much is Too Much? </p><p>A standard alcoholic drink is defined as a regular can of beer (330ml), half a glass of wine (175 ml) or one nip of spirit (35ml).